St. Francis Catholic School on Hilton Head Island, SC, supports the Hilton Head/Bluffton communities in the Diocese of Charleston, SC. This includes the parishes of St. Francis by the Sea and Holy Family. St. Francis Catholic School’s mission is to nurture its students’ spiritual and intellectual growth in an authentically Catholic community committed to academic excellence. We value a nurturing and disciplined environment. We value a variety of opportunities and enrichment activities for our students. To help children grow and mature in their faith-life through participation in the sacramental life of the Church. To teach authentic Catholic doctrine in accordance with the Magisterium of the Church. To provide each student with a solid academic background, using the best available teaching methods, materials, and technology. To encourage each student to become self-disciplined through a consistent, fair, and structured environment. To help each child to develop intellectually in order to meet the demands of society and to make valid choices based on truth. To instill in each child a concern and awareness for the oppressed and needy, motivating him/her to action and service. Our hope is that every graduate of St. Francis Catholic School is a person of FAITH, INTEGRITY, and SCHOLARSHIP. For a copy of our Application procedure and registration information 2019, please click here. Applications are also available in the school office. To tour the school, please contact our registrar, Sister Kathleen Kane, at 843-681-6350, ext. 266. St. Francis Catholic School (PK-8) on Hilton Head Island, SC is seeking a full-time Science Teacher for the 2019-2020 school year. Position includes teaching Middle School Science to students in 6th through 8th grade as well as teaching Discovery Lab one day a week to Pre-K through 5th grade students. St. Francis Catholic School possesses an exemplary faculty and staff wholeheartedly committed to Catholic education. Candidates for this position should be skilled in working with a team, collaborating with colleagues and parents, and communicating in a professional manner. Interested candidates should send a cover letter, resume, transcripts, two letters of recommendation to the mailing address below or by e-mailing Brian Pope. 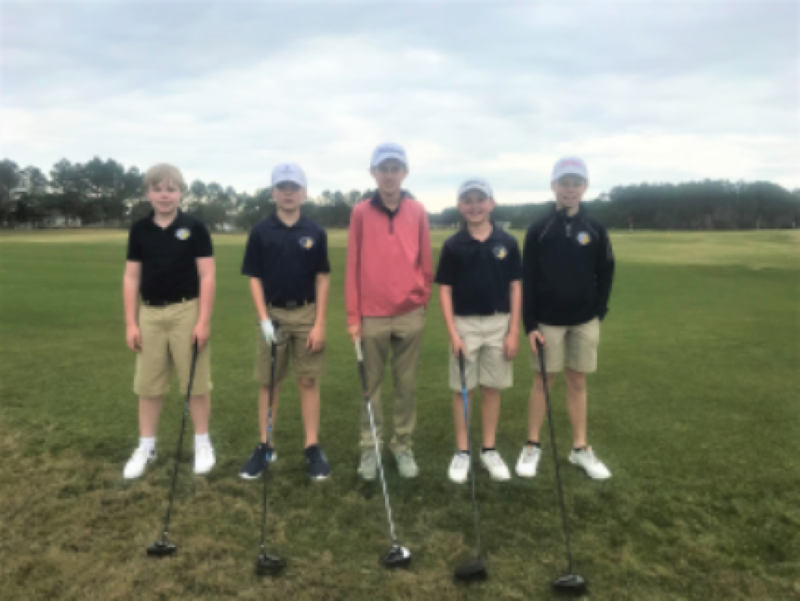 St. Francis Catholic School had a Golf Team this year led by Coach (and Principal) Brian Pope. They were small in number, but mighty in their swings. The golf team finished the season undefeated and are already looking forward to next year. That St. Francis Catholic School has a used uniform closet? We have a wide selection of new and gently used articles of clothing for Pre-K through Eighth Grade. These items are all donated back to the school and are free for any family/child who wants them. Before you buy new uniforms, please come check out what we have in stock. Or if you have any uniforms that do not fit your child anymore, please bring them to the school office to be offered to someone else. For more photos of St. Francis Catholic School, please click on this link. Publix keychain cards have been discontinued. Please take a few minutes to link your phone number to the school so we will continue to receive donations from Publix. Create an account with your phone number by clicking on this link and link to the school on the "Publix Partners" page. Keep clipping those Box Tops too! John Paul II Catholic School is committed to preparing students with diverse learning abilities for the challenges of life through intellectual, physical, and spiritual programs that advance academic excellence, leadership, a healthy lifestyle, and service to others while fostering discipleship according to the traditions of the Catholic faith. 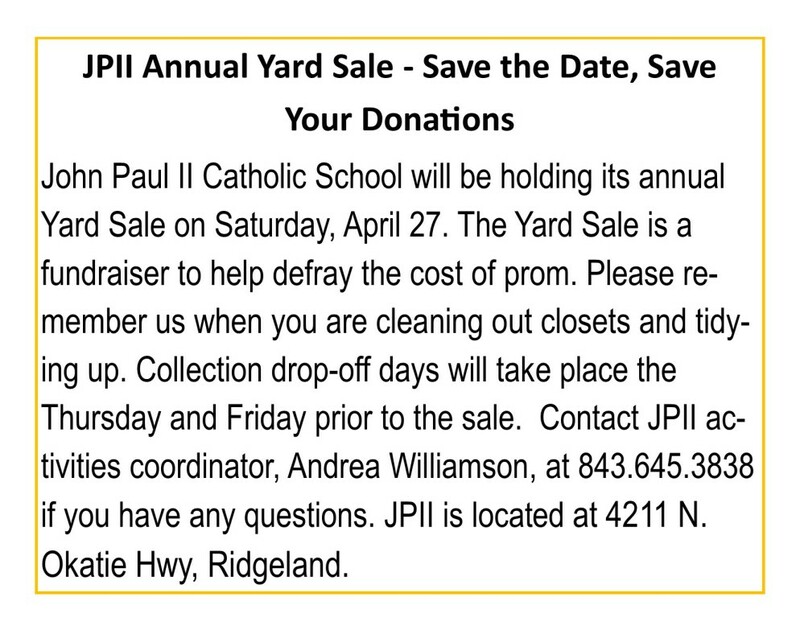 It is Admission Season at JPII! If you are considering a new school for your child(ren) for the 2019-2020 school year, please consider John Paul II Catholic School (7th through 12th grades). Our dedication to what is being cultivated in the classroom, hallways, and athletic fields, is undeniable. The grace of a Catholic education is evident in the daily presence of Jesus Christ, the application of rigorous academics, and the quality and passion of our faculty and staff. "Do not be afraid. Do not be satisfied with mediocrity. Put out into the deep and let down your nets for a catch." - the bold and brave words of St. Pope John Paul II. Visit out school website or call the office at 843-645-3838 for application information, a campus tour, or shadowing opportunities or you may click on this link to download an application. As JPII continues to improve its academic program, it continues to expand and refine its AP curriculum. This month, 67 students are scheduled to take 141 AP exams. Last year, only the second administration of AP exams at the school, yielded an impressive 71 percentage of the students receiving a score of 3 or above! JPII will be offering 15 AP courses in 2018 - 2019: AP Environmental, AP Human Geography, AP Psychology, AP Language and Composition, AP Literature and Composition, AP Statistics, AP Calculus, AP Biology, AP United States History, AP United States Government and Politics, AP European History, AP Computer Science Principles, AP Art History, AP Studio Art and AP Music Theory. 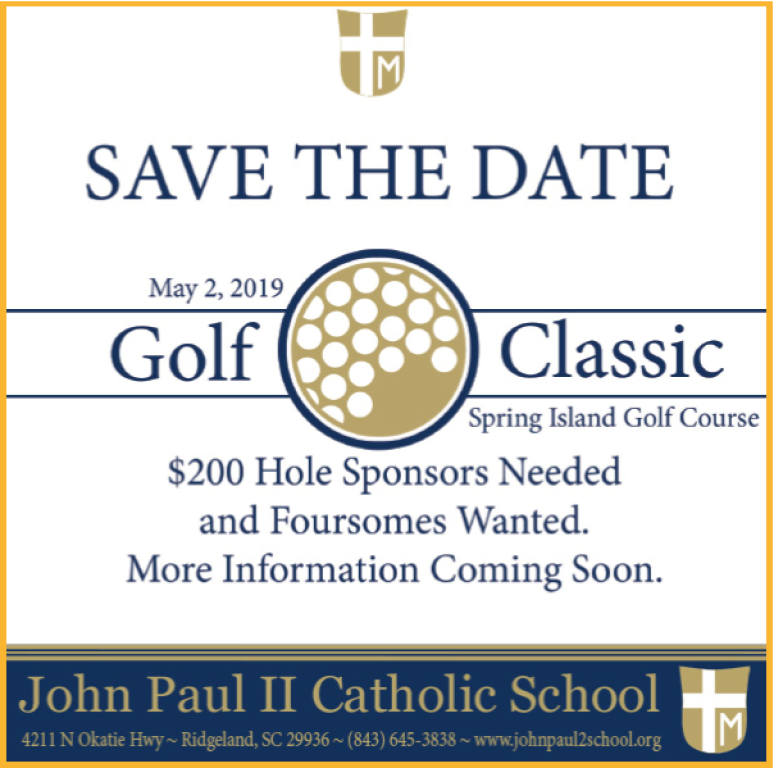 For more information about the JPII admissions’ process, please visit the John Paul II website at or call (843) 645-3838. Registration forms are available in the Narthex or to register online, you can click on this link. For more information on Sponsorships, Awards Reception details, Teacher Sponsors, Silent Auction items, and more, contact John Dever. 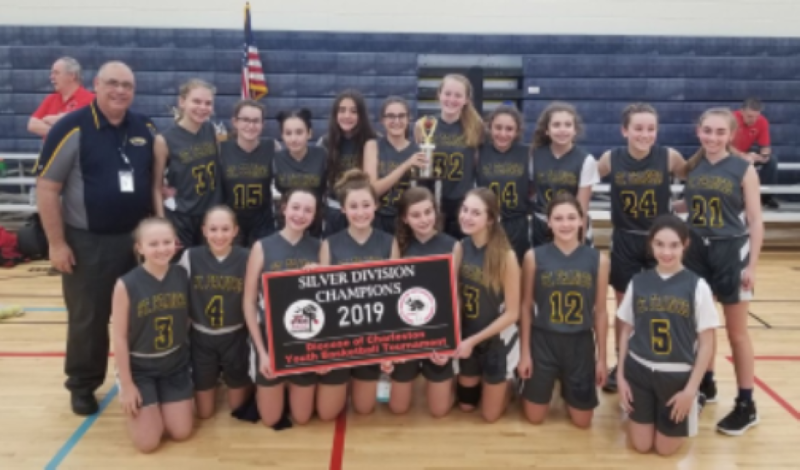 Congratulations to all of our basketball teams for their performance in the season ending Diocese of Charleston Youth Basketball Tournament held in Aiken, SC. Our senior girls team, with Coach Joe Benning, even won the Silver Division! Excellent job Wolves!! Our Senior Girls won the Low Country tournament hosted by Prep as well! 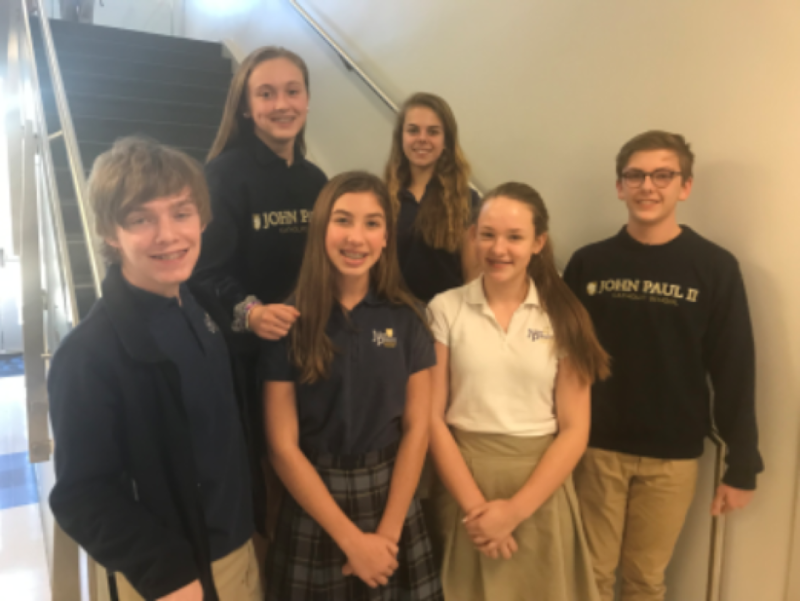 Six JPII eighth graders have qualified as Junior Scholars in South Carolina based on her/his PSAT results. The Junior Scholar Program was developed by the South Carolina Department of Education to identify eighth grade students with exceptional academic talent and to develop strategies for inclusion into special program. Eligible students who scored at least a 550 on Evidence-Based Reading/Writing OR at least a 530 on the Math section are identified as South Carolina Junior Scholars. Congratulations, Students! For more photos of John Paul II Catholic School, please click on this link.